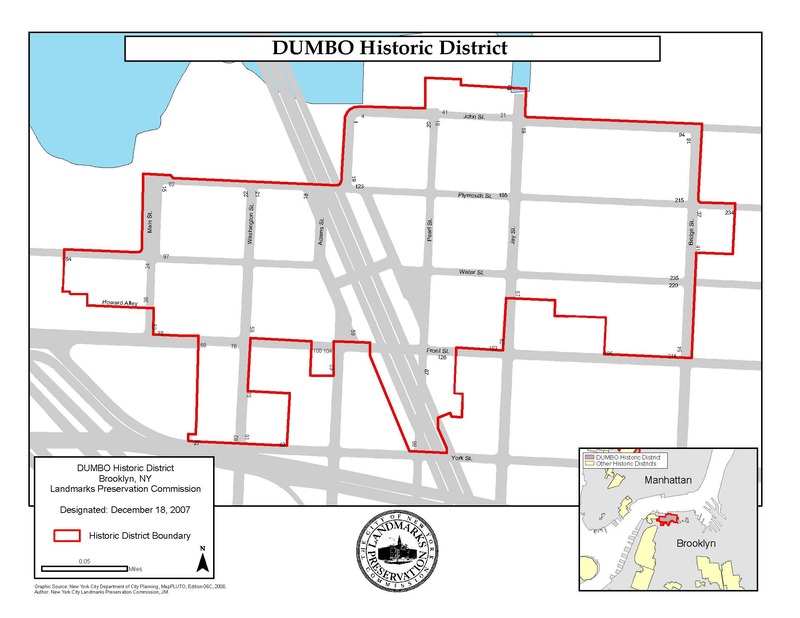 Proposed DUMBO Historic District. Map: LPC. Local elected officials behind push for designation. On December 18, 2007, Landmarks voted to designate a portion of the DUMBO area as an historic district. DUMBO, an acronym for Down Under the Manhattan Bridge Overpass, served as a center for American manufacturing beginning in the 19th century. The architecture of its industrial buildings range in materials from brick and timber to reinforced concrete. In the 1970s, young artists began moving to the area and converting the buildings into lofts and studios. At the October 30th public hearing, several elected officials, including City Council Member David Yassky, Brooklyn Borough President Marty Markowitz and representatives for Congresswoman Nydia Velazquez and State Senator Martin Connor, joined local residents and supported designation. 4 CityLand 157 (Nov. 15, 2007). Landmarks then unanimously voted to designate the area, which was met with applause from the assembled preservationists. LPC: DUMBO Historic District, Brooklyn (LP-2273) (Dec. 18, 2007).